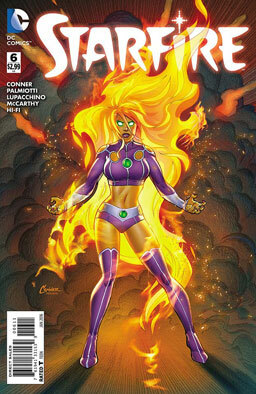 An alien bounty hunter pursues Starfire and isn’t shy about killing humans. Can Kory stop him, or is her head going on a pike? Verdict: Thumbs up. Good humor and action, very pretty art, and that cover is a solid winner. While tracking down the Lizards, Spider-Woman meets up with a much different Captain America than we know. 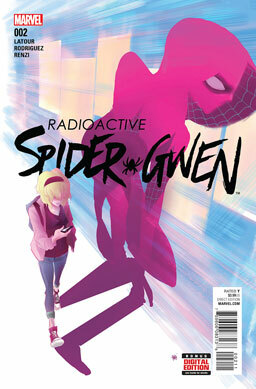 Can Gwen handle the Lizards and Cap — while handcuffed? Another new number-one issue! MARRRRVEL! (shakes fist at sky) Most of our story is set in the future. 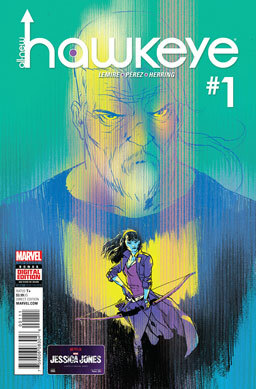 Clint Barton is a washed-up old coot, and Kate Bishop is rich and bitter and pretty damn good at her job. They’re trying to make up for the mistakes of the past — and that means they’ll run afoul of the Mandarin. Verdict: Ehh, good enough for a thumbs up. Artwork and personality conflict are what sell this story the best. Verdict: Thumbs up. I wasn’t expecting to like this one so much. 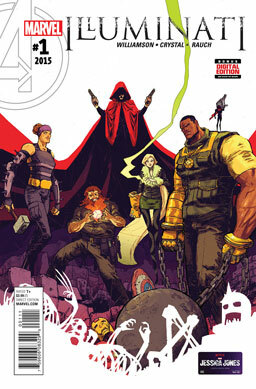 The art is cool, the action is excellent, and the dialogue and characterization are fun. I reckon I’ll be picking up a few more issues of this one. Man, they’re gonna run out of Avengers titles before long. 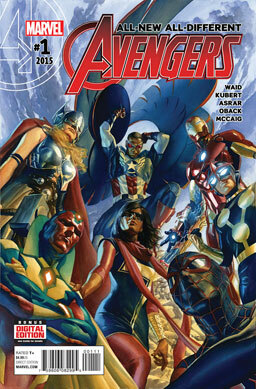 The members of this team include Captain America, Iron Man, Thor, Vision, Ms. Marvel, Nova, and Spider-Man. Ahem, that’s the Sam Wilson Captain America, the Jane Foster Thor, and the Miles Morales Spider-Man. Not all the characters have even met yet, but the stories around them are plenty fun. Verdict: Thumbs up. Yeah, I’m really looking forward to seeing Mark Waid writing these characters. 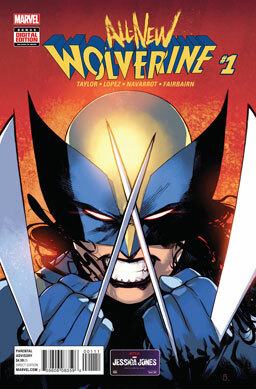 This is probably one of the new Marvel titles I’ve been looking forward to the most. Titania has been released from jail and plans to give up the criminal life. She’s doing her best, but it’s hard for ex-supervillains to get jobs anywhere. She-Hulk is willing to help her, but they’ve been rivals too long, and Skeeter rejects her aid. She manages to get a crap job as security at a pawn shop, but a robbery attempt ends with Luke Cage and Iron Fist assuming she’s the villain. And then she gets “rescued” by the Hood, who’s putting together a new gang of under-the-radar super-crooks. Verdict: Ehh, it’s not bad, but I’m not sure I’ll be picking it up. We barely meet any of the characters aside from Titania and the Hood, and though Titania is a fun character, I don’t think there’s enough here to make me feel like I need to keep reading. 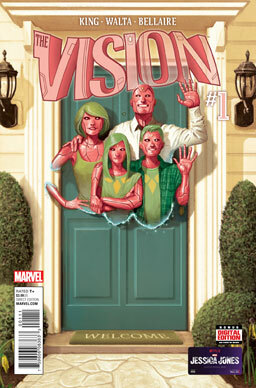 In an attempt to be more human, the Vision has created his own family — his wife, Virginia, and their twins Viv and Vin. The entire family is deeply weird, terribly ominous, and they’re all utterly, utterly unhuman. Verdict: Thumbs up. Wow, this one was amazing — an astonishingly creepy comic about robots pretending to be normal human suburbanites while actually being skin-crawlingly weird. It is so, so good. 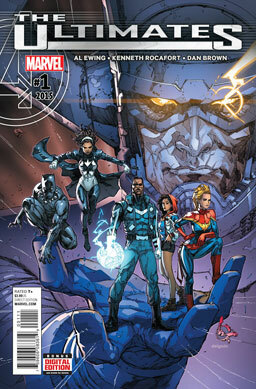 Yet another branch of quasi-Avengers, this team consists of the Blue Marvel, the Black Panther, Captain Marvel, America Chavez, and Monica Rambeau. They’ve got an extremely ambitious and wide-ranging plan to neutralize Galactus — and it’s not what anyone expects.